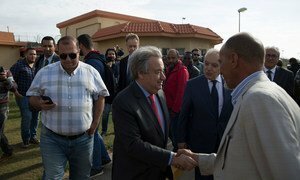 UN Secretary-General António Guterres meets refugees and migrants in a detention centre in Tripoli, Libya. 4 April 2019. He was speaking to reporters after holding meetings with senior politicians and others there earlier in the day, to advance the UN’s idea, first proposed more than a year ago and discussed in town halls across the country, of convening a Libyan National Conference on the nation’s political future, which could finally end years of turmoil following the removal from power of Muammar Gaddafi, in 2011. The Conference, he said, would be “Libyan-led and Libyan-owned inside Libyan territory to be able to discuss the future of Libya…And the UN is totally committed” to organizing it, he added. 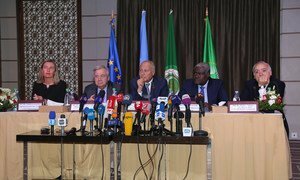 Following the movement of military convoys from the east towards the capital, reported early on Thursday, the UN chief made a “strong appeal” for de-escalation and an end to any deployments by any military factions within the fractured State. Resuming political dialogue between the internationally-recognized Government and military factions which control - or are seeking to control - other parts of the country was essential, said Mr. Guterres: “I am ready to assume the initiative that might be necessary for that to be possible, if the conditions allowing for it are met”, he added. The UN chief also described how he had been “moved and shocked” after visiting a detention centre for refugees and migrants, “shocked by the level of suffering, and especially by the level of despair that I found. This is, of course, not only a responsibility for Libya, it’s a responsibility for the whole of the international community”, he added.